Always a popular segment of golf, distance measurement device options have multiplied perhaps unlike any other area. The goal for many has been about undercutting the most well-known names out there to provide options which offer the same bells and whistles, yet in a more affordable package. Shot Navi is a brand many here in the States likely have not heard of, but they mince no words when it comes to their status in Japan. THP was able to get in a wide range of distance devices for reviews, and this particular article focuses on the N2 Handheld GPS. Pre-loaded 30,000 Courses, No Addtional Fees – ShotNavi constantly update our course databases to provide our players with optimal golf experience. 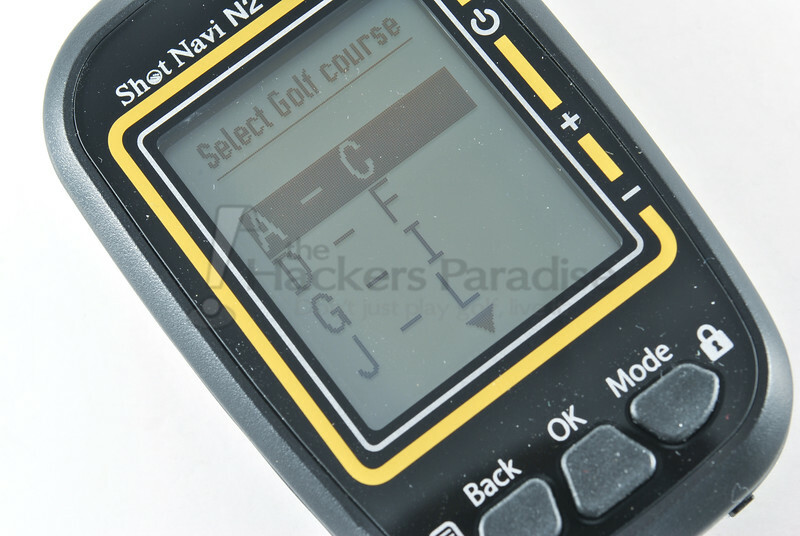 The ShotNavi N2 comes preloaded with more than 30,000 golf course data so that 30,000 golf course data so that you can use the N2 immediately on a golf course. Multiple views, Digital Scorecard – By clicking the Mode button switches from a view to another easily and quickly. You can select the views from standard view (distance to front/center/back of the green), hazard view (distance to the hazards), and digital scorecard view as necessary. The multi-view function takes your game to the next level. 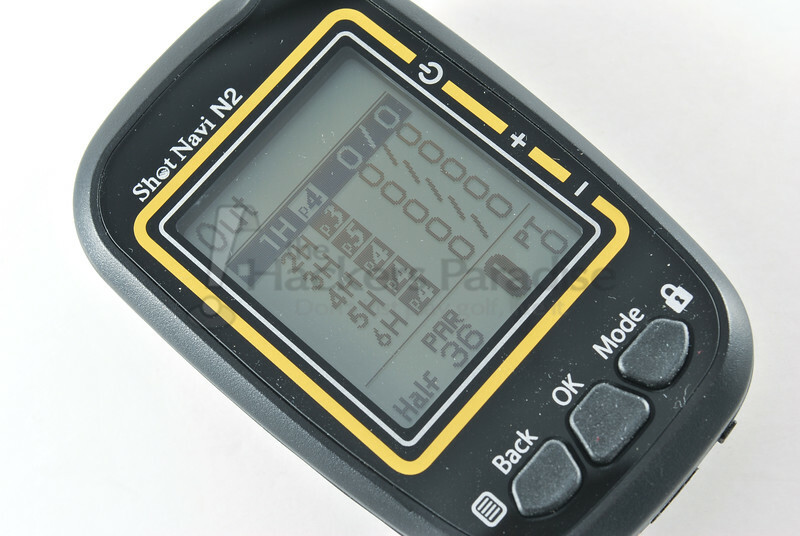 Made by Japan / Japan Quality – Shot Navi is a best-selling golf GPS in Japan for years. Our products are designed and developed in Japan where is known for high quality & accurate production. 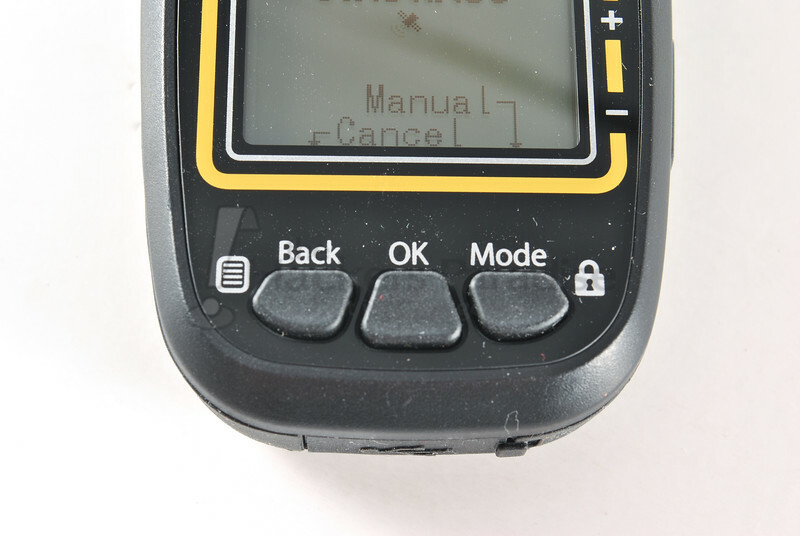 The Shot Navi N2 GPS is overall a very compact unit, in fact it literally fits into the palm of your hand. That said, the concern with a smaller size is always ergonomics of button placement and general navigation. The combo use of side buttons and face buttons make the unit much easier to navigate than some of their competitors who try to cram everything on the face or side exclusively. The unit also comes in two simple color combo’s black/gold (which THP received for review) and black/white which is the cleanest looking of the two in the opinion of this reviewer. The button placement is important, but none of that matters if the screen itself is not legible. While the display gives off the feeling of a GPS watch, the pixels maintain easier clarity on the slightly larger screen. The decision to keep it simple with dark text on a lighter background makes it easier to see at different times of the day, and the auto backlight feature should please as well. All told, it’s extremely lightweight and compact, but held up to the beating it was given during review from being in the pocket with divot tools and tees, to bouncing around in the cart, there were no notable cosmetic or physical issues seen with the Shot Navi N2. People love bells and whistles when it comes to electronics, it’s just in human nature to be that way. That said, sometimes there is such a thing as trying to put too much into a small package. Simply put, the Shot Navi N2 does a LOT of things. Not only does it rotate through five different views (even allowing you to switch to a landscape view), but it also offers audible distances to the user. At the root, it is a simple front, middle, back device, but it also offers a scorecard, distance/club tracking, and hazard tracking. With 30,000 courses uploaded, the quality of the data provided will be dependent on the course being tracked. For instance, not all of the hazards are listed on one of the courses I played while using the device. However, it sync’d incredibly quickly for me on the auto sync, you can also select the course manually by region/state/town/etc, but that menu is admittedly a bit cumbersome. Similarly, the shot tracking and score card features, while nice to have, require some “getting to know you” time to let the button/menu navigation become a bit more second nature. During review, it actually got to the point where I stopped fussing with those options and just focused on the GPS distances, and when that happened the unit became much more enjoyable. 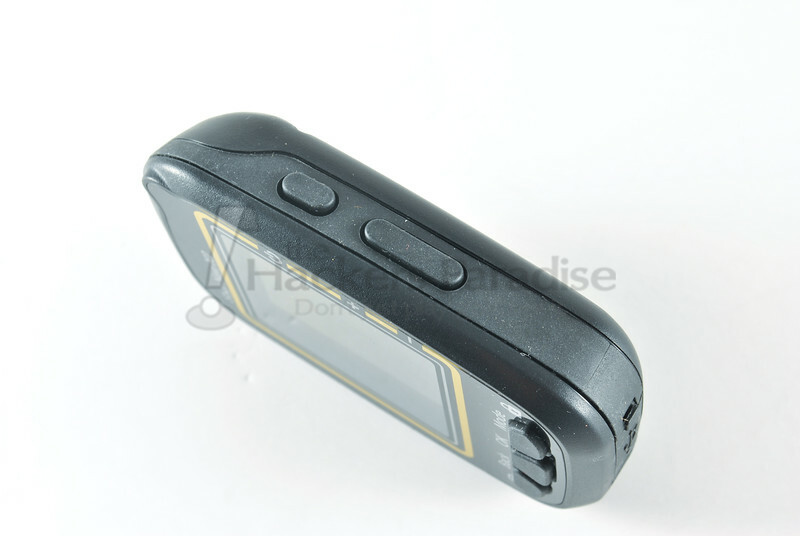 The N2 was compared to two other GPS devices from what we here in the U.S. consider to be “major” brands on three different courses and the unit was within 1-2 yards constantly. It is the opinion of this reviewer that such a range is actually quite good, especially given the price point. Shot Navi also claims 15 hours on the battery, while that was not reached during review, three rounds were played on it in one day without the battery dying (about 3 hr/round) and it very well could have gone longer, but that was quite enough of a positive showing to stop there. As always, options are good, and affordable options are even better, if they work. Brands like Shot Navi have been making their way stateside more and more via the Amazon marketplace and it is great for pricing competition but functionality will always trump price. The Shot Navi N2 does a lot well, it is quite accurate and picks up a signal very well, but there is also a lot going on when it comes to “extras” that are possibly not as naturally intuitive as some might hope for. In the end though, for the size and price ($99.99) it offers much more to like than to be bothered by. More on everything that Shot Navi offers can be seen on their website, www.ShotNavi.net. Excellent review James. If I opted to go the GPS route, I would go with a handheld unit like this that I can comfortably slip in my pocket over a watch. The price is right as well. Perfect little device, price point is spot on. I can definitely see where trying to use all the functions it offers would be a bit cumbersome (anything time consuming other than playing golf is not a good thing on the golf course). One question: does it happen to have anything built into the sides or back where maybe something could be looped through it and attached to a bag like for walkers? Excellent review James. All three of the devices reviewed seem to be very solid choices. The price point on this one is fantastic and this looks like a very solid choice. 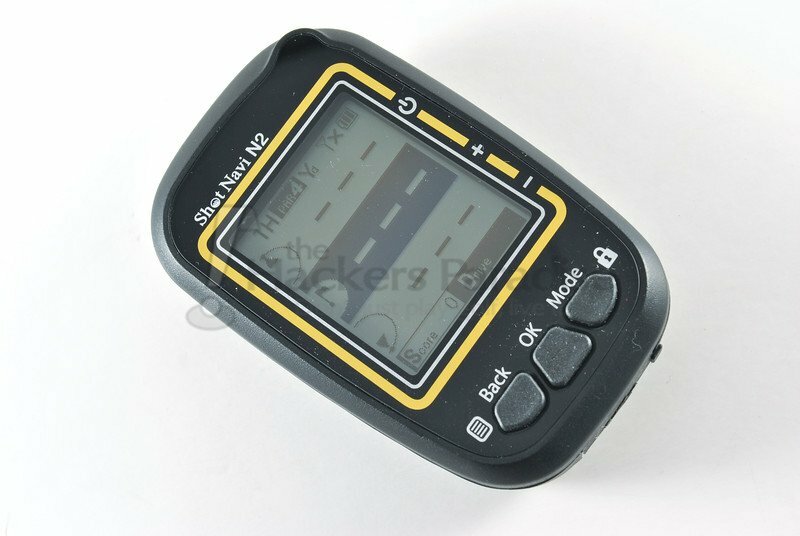 Am looking to purchase a handheld GPS, and like the look of this one. Can you tell me whether it shows distances in both yards & metres.